I was so very happy and honored when Maria from A Night's Dream of Books asked me to write a guest blog. The first task at hand, deciding on what topic to write about was half the fun. As both Maria and myself share a love for the original 1960’s era Star Trek Series and I have lots of thoughts on that topic, we decided that I would write about how that television show has been an influence upon me and my literary tastes in so many ways. Readers can find Part I my commentary on the subject here and here. While over there please do look around Maria’s Blog. Aside from that fact that it is one of the most aesthetically pleasing sites out there, Maria provides warm, enthusiastic and intriguing commentary on a host of books and topics. In addition to classic literature, Maria covers another favorite topic of mine, Science Fiction and Fantasy. At this very interesting blog one will also find deep meditations on theology, mythology and humankind’s place in the universe. It is such a fun place! Thanks for the opportunity Maria! Live Long and Prosper! I managed to get several chunks of multi-hour reading in over the last several days. This is an all too rare occurrence for me lately. Readers of this blog know how much I love to delve into books. To my consternation, there is so little time to do it! I have a job that requires fairly long hours from me. In addition, as much as I love the practice of reading and feel that it is my most important hobby, there is also more to life. I love the outdoors, food culture and cooking, keeping abreast of current events and various technical interests and so much more. I devote time to family and friends. All this leaves me insufficient time to pursue the ingestion of the written word. Of course, reading is indeed a very high priority! I often irresponsibly do without sleep in my determination to conquer pages. I have also forsworn virtually all television in an effort to gain reading time. OK, I do watch a little television while eating breakfast and preparing for the day. This time is not time that I would be reading anyway. Ironically, a fair amount to this television time is spent watching Book TV! Of course everything is relative. I spend more time with books than do the great majority of family, friends and coworkers. It is a priority in my life. Yet, when I look at the rapidity that some of my fellow bloggers move through books, I am positively green with envy! If I ever get to retire, and that is a long, long way off, I hope to return to the long stretches of unfettered reading that I enjoyed in the days of my youth! Thanks again to Caroline for organizing Antonio Tabucchi week. Please visit here for a comprehensive list of all participating blogs. 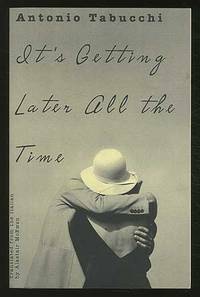 It's Getting Later All the Time by Antonio Tabucchi is a very innovative and different book. Not a traditional narrative at all, it is instead an epistolary novel consisting of a series of letters from men, written to their estranged and sometimes deceased lovers. This work was challenging for me. It is mostly written in a post – modernist style. Some, but not all, of the letters are extremely difficult to follow. Some jump from subject to subject in all sorts of cryptic directions somewhat randomly. Some make myriad and, at times, obscure and arcane references to art, history, culture and science at a breakneck speed. I was glad that I had a mobile device at hand so as to look up many of the references online that would otherwise have flown over my head. Other letters are relatively straightforward and easy to follow. All are poetic and beautifully written. Sometimes they are funny. At other times they are heartbreaking. Throughout the novel multiple common themes recur, sometimes in a seemingly haphazard fashion. This book takes mental work! In several passages, Tabucchi describes memory and thought as being broken up into shards. Likewise, the ideas and motifs in this book are presented in pieces. The author begins to develop a bit of an idea and leaves it hanging as the prose scurries off in a new and unexpected direction. Often the idea will return in another letter, sometimes in a different “key”. There are recurring symbols. Goats, circles and angles are examples of imagery that reappear multiple times. At times I was befuddled. As I alluded to above, I cannot imagine reading this book without the assistance of an Internet search engine. This electronic aid was indeed very helpful. The author’s postscript also provided very informative insights. It seems as if Tabucchi realized that this book was a tough nut to crack, and decided to provide a little help! Finally, healthy spurts of rereading passages after completing the book make me feel as if I had turned the tide in the battle to de- encrypt what Tabucchi is trying to say. This theme that demonstrates the lack of significance of our physical bodies is further developed into the idea that there is a lack of significance relating to actual action and experience. Instead, Tabucchi implies that it is imagination and memories, which are often false, and, above all, the words which make us real and are really important. Again and again, memories are often shown to be inaccurate, yet crucial, in the development as to who we are. The above is just one of multiple intellectual threads developed by Tabucchi. If reading this book sounded like it was a little difficult, it was! However, I thoroughly enjoyed the journey. This type of reading experience is my cup of tea. I love to try to dig deep, to interpret, and to work a bit on the book that I am occupied with. I take satisfaction in the fact that I was able to crack some of Tabucchi’s secrets. I am tempted to read this work again, right now, from cover to cover, as I suspect such an undertaking would reveal a world of new understanding. To read this book I recommend three things: first, a strong desire and curiosity to delve into the author’s very creative mind; second, patience, as some rereading may be necessary; third, a reliable Internet connection! In addition to the intellectual challenge that Tabucchi presents, he is also a wonderful writer who shows mastery of many styles. His themes and philosophies, while difficult and dense, are the product of a great imagination and contain both wisdom and insight. I recommend this one for enthusiastic and determined readers! The English version of this book was translated by Alastair McEwen. Many thanks to Jennifer at The Relentless Reader for inviting me over to her blog to write a guest post! I am so honored that she is allowing me to share my thoughts with her readers. When Jennifer and I discussed the nature of my post, I suggested that she choose either a favorite book or just a book that she was interested in hearing another reader’s thoughts on. I would read the book and write commentary for her blog. 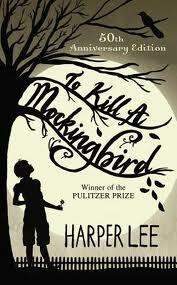 Jennifer chose Harper Lee’s To Kill a Mocking Bird as it was not only a favorite of hers, but she was in the midst of a reread. I had never read Lee’s famous novel. As it turns out, this was a great choice. Readers will need to look here at Jennifer's blog to find out why. While over there, please check out as many of Jennifer’s posts as you have time for. I think that anyone who enjoys my writings will love Jennifer’s site. She has terrific taste in books that usually mirrors my own (After all, if I thought that she would have chosen something like Fifty Shades of Grey, I would never, of course, suggest that she pick a book for me read!). Her blog is also witty and funny. Though she usually comments upon serious books, both intellectual content as well as amusing tidbits can be found on her site.